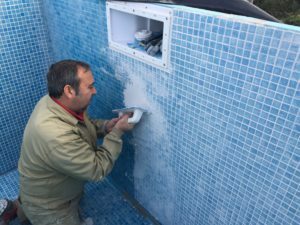 Before explaining how to cover a polyester pool with a glass mosaic, it is important to note that these so-called polyester or fibre-glass pools are actually a mix of two materials. 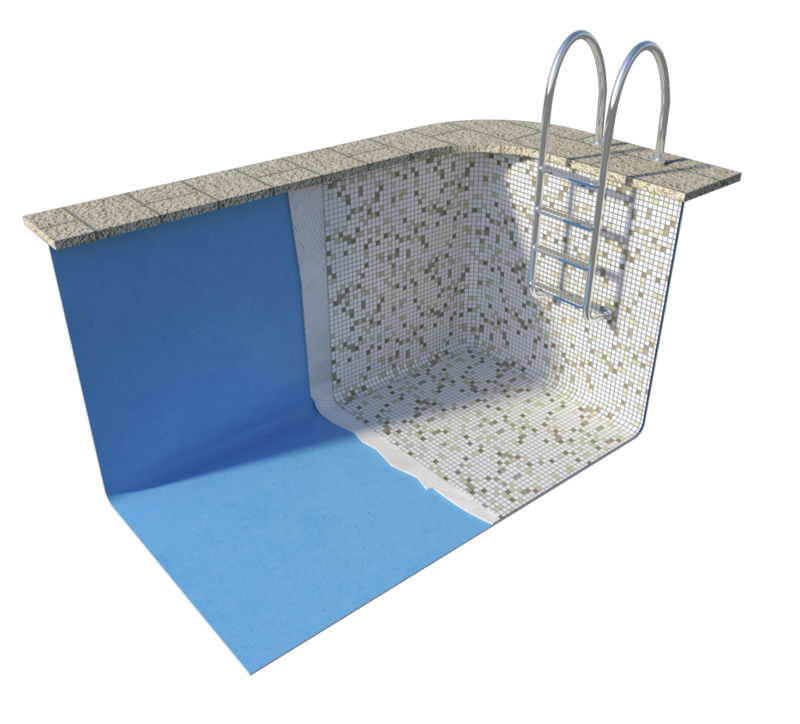 In order to build the pool bottom, the two resins are mixed, creating a resistant, long-lasting structure. Glass mosaic tile polyester pool. 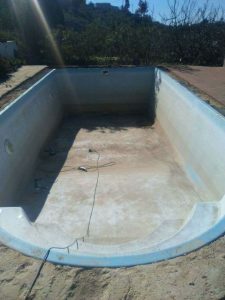 Previous versions of polyester pools often had issues with the watertightness on the bottom as a result of cracks forming. These cracks don’t normally cause any structural problems for the pool, but do impact watertightness. There are also some cases where clients prefer to revamp their polyester pool with the more attractive and durable mosaic finish. After the process is completed, we have a beautiful glass mosaic tile polyester pool. 1) The first is for repairing pools that have had problems with cracks forming. Thanks to the Signapool system, we can secure the structure with a Signapool plate and then place the mosaic finish directly on top of the plate. 2) The second is for revamping polyester pools with a mosaic finish. To do so, we use the EPOGROUT epoxy adhesive to attach the mosaic onto the polyester and to grout the mosaic. The most common (cement-like) grout is not waterproof and after a few years it starts to decompose and/or mould appears. This is due to the very limited chemical resistance of the cement-like grout. Furthermore, this grout is not waterproof and it allows water to leak through seals. For this reason, grouting with Epogrout is essential, especially in polyester pools with glass mosaic tiles. This is due to the movements in polyester or glass fibre which can crack the cement seals. 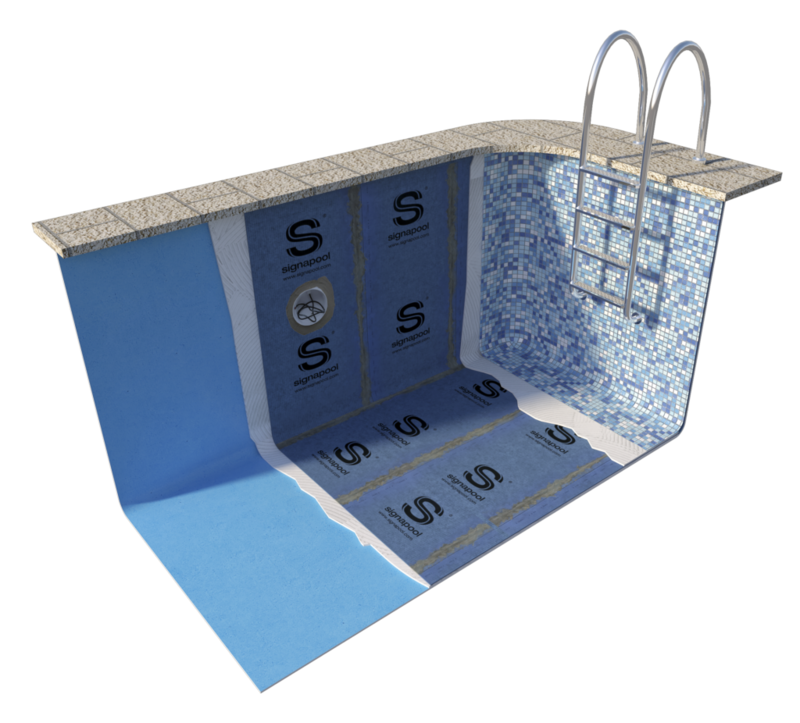 The complete Signapool waterproofing system guarantees a successful revamp by bolstering the pool bottom with the Epogrout epoxy grout. It is 100% waterproof, highly resistant (against both normal or salt chlorination) and it does not become discoloured over time. What’s more, the EPOGROUT epoxy grout is very easy to apply (similar to a cement grout). 1. Mix all three components with an electric mixer. 2. Spread the product using a hard rubber trowel. Apply the product to the joints diagonally. 3. Gather all excess with the same rubber trowel. 4. Immediately after, clean the area with water and a Scotch-Brite sponge using circular motions. 5. Then soak up this mixture with a sponge trowel.